Every June the Priory is the setting for the Lanercost Festival. The Festival was first held in 2004 and has since become a regular fixture. The festival website contains details of the recent 2014 programme. The 2015 Festival will take place 23rd to 28th June. 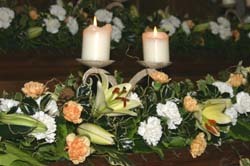 In December 2005 the Priory hosted an incredibly spectacular flower festival which brought visitors from far and wide and provided an amazing backdrop for our Carol Service and Christmas services. 2006 marked the 700th anniversary of Edward I's last visit to Lanercost. He arrived at the Priory on 29th September 1306 in very poor health and spent the winter at the Priory in a building specially constructed for his visit. He was joined by Queen Margaret, for whom another building was constructed. In March 1307 his health allowed him to move on, but by July he was dead. The occasion of his visit was commemmorated by the installation of a stained glass window designed and made by Christine Boyce, not only a very talented stained glass artist but also a member of our congegration. The installation took place on 29th September 2006 at a service attended by HRH Prince Edward, The Earl of Wessex, the Archbishop of York and Primate of England, Dr John Sentanmu, the Primus of Scotland, Dr Idris Jones, and the Bishop of Carlisle, Graham Dow. The occasion was further marked by a grand ball and the first performance of 'Edward I, the Musical' in the Priory. In December 2008 the Priory hosted an equally spectacular Christmas Tree Festival which brought visitors from far and wide and again provided an amazing backdrop for our Carol Service and Christmas services.